In Costa Rica, a criminal complaint can report workplace harassment, a home invasion or sexual assault, among other crimes related to the state. Any person who is in Costa Rica — adult or a minor, national or foreign — can file one. You can submit a criminal complaint in a variety of ways, including through your local police station or Prosecutor’s Office (Fiscalía), the tourist police or — as the United States Embassy recommends — the Judicial Investigation Police (OIJ). Each government institution handles different types of criminal complaints. Three institutions that offer an online portal or form are the Comptroller General (Contraloría de la República); the Ombudswoman’s Office (Defensoría de los Habitantes); and the Public Security Ministry (Ministerio de Seguridad Pública), which provides this online form. The Ombudswoman’s online portal features questions in Spanish, but responses can be submitted in English (scroll down to “How To” for a complete translation of the questions asked). For the Comptroller General, you can stop by their San José office in Sabana Sur (scroll down to “How To” for all directions and links), call the office, write an email or a letter, or submit a form through the online portal. The Comptroller’s portal focuses on complaints about misuse of public funds, but the institution will also receive criminal complaints and refer them to the appropriate institution, and officials from the office told The Tico Times they are prepared to provide assistance to English speakers. The complaint should contain a description of the facts in a precise, clear and complete manner with sufficient detail to allow further assessment. The complaint should be guided by the following questions: (1) What happened? (2) Who is the alleged perpetrator? (3) How did it happen? (4) Where did it happen? (5) Why did it happen? It is also necessary to include names, circumstances, places, dates, details about the event being denounced, an estimate of any economic damage (if applicable), and evidence such as documents or witnesses. No matter what institution receives the complaint, after it is filed, a number is assigned to track the status of the complaint. The office handling the complaint determines the facts of the case under the guidelines of the state. If accepted, the complaint could be further investigated or transferred to an internal unit within the government. Investigations are carried out if there are enough elements to pursue a conviction. While this differs in every case, the clearer, more detailed and precise the information provided, the more elements the office will have to pursue an investigation. If a complaint being reviewed is outside the scope of competence of the department to which it was submitted, authorities will give advice to the person filing the complaint so the situation can be solved in an appropriate manner. Anonymous criminal complaints can be filed, but if anonymity limits the ability for further investigation, authorities may ask the person filing the complaint for more information; otherwise, the denuncia may be archived. Confidentiality will be maintained if there is danger to the moral or physical integrity of the person filing the complaint. In cases of sexual harassment, people with HIV or AIDS, or minors under 15 presumed as either victims or perpetrators, confidentiality is guaranteed. When the age of the minor is equal or greater to 15 but under 18, the person filing the complaint will be consulted regarding their confidentiality in the case. There is currently no legal deadline for a complaint to be made, though there may be a statute of limitations for investigations or further legal action. Once the case is concluded, the person who filed the complaint will be informed about what the state has established. The following steps will guide you through submitting a criminal complaint through the Ombudswoman’s online portal. Although the questions are in Spanish, you may answer in English. To reiterate, a criminal complaint can also be filed through your local police station or prosecutor’s office, the tourist police and the Judicial Investigation Police (OIJ). 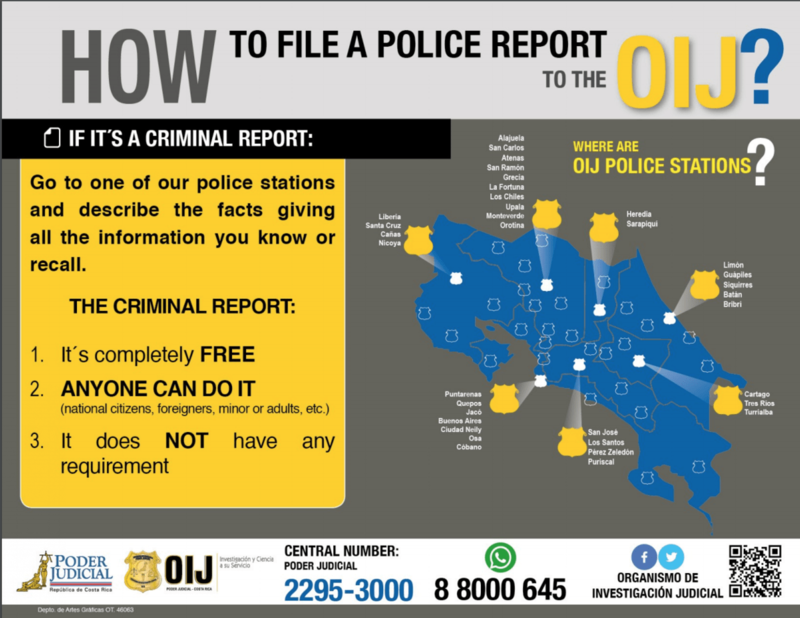 The U.S. Embassy recommends that U.S. citizens report crimes to the OIJ and contact the Embassy for assistance. However you submit a denuncia, you will be asked similar questions to those found in the Ombudswoman’s portal, translated below. ¿Deseo que mi Denuncia sea Confidencial? Do you want your criminal complaint to be presented as confidential? Type of Identification: You can choose from an identity or resident card, passport or others. Have you denounced this case in other instances? You can bring them up in this space. Si conoce personas que podrían ampliar o aportar otros elementos sobre los hechos denunciados, puede agregarlos aquí. Debe señalar al menos un medio para localizar a las personas citadas en su denuncia. If you know people who could contribute or expand on other elements of the reported facts, you can add them here. Indicate a way to locate the people cited in the complaint. The process can also be done in person at the San José offices. Judicial Investigation Police (OIJ): oij_denuncias@poder-judicial.go.cr; phone 2295-3644; or fax 2295-3114. The Comptroller: contraloria.general@cgr.go.cr; phone 2501-8000 or 2501-8025; or fax 2296-6764. The Public Security Ministry (MSP): Via this online form. Verbal reports can also be made in person. Here is a link to all OIJ offices in Costa Rica, many of which are open 24 hours a day. The Contraloría General de la Republica offices are located in Sabana Sur, San José, off the intersections of Avenida 12 and Calle 50. Here is a map with contact information for all prosecutors’ offices across Costa Rica. Disclaimer: The Tico Times consulted the Judicial Investigation Police (OIJ) and Comptroller General’s Office for this story. However, we are not lawyers and this should not be considered legal advice.